The Mollusca, or molluscs, is a large phylum (group) of invertebrate animals (animals without backbones). 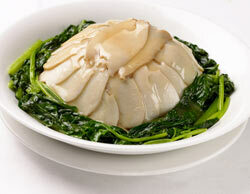 The name Mollusca means 'soft-bodied' and, although some have developed a tough shell, they are all soft on the inside. They are one of the largest animal groups with about 200,000 species worldwide which make up about a quarter of all marine animals. In Australia there about 15,000 species. Molluscs are found in marine, freshwater and land habitats. There are great differences in the size, structure, behaviour and habitats of molluscs. Their habitats range from the arctic seas to tropical streams, from valleys to mountains 7,000 metres high and even deserts, whilst some are parasites. There sizes range from microscopic to the giant squid which can weigh over 270 kg and grow more than 12 metres long, with tentacles up to 50 metres in length. There are six major groups Molluscs – the bivalves, cephalopods, chitons, gastropods, tusk or tooth shells and the aplacophorans (spicule worms). Three features shared by almost all molluscs are an unsegmented, soft body, a muscular foot or tentacles, a mantle that can secrete a shell. Molluscs, because of their ease of capture, taste and beauty have long been important to us. Many molluscs are eaten by humans, for example abalone, clams, cockles, mussels, octopus, oysters, periwinkles, scallops, snails, squid, whelks and more. Molluscs have also been used by humans for thousands of years for many other purposes. Mollusc shells have been used as decorations, for jewelry and as money rather than coins. Dyes like Sepia, a brown pigment used by artists was made from Cuttlefish ink. Some molluscs are harmful to humans. For example, some cone shells can inject a deadly toxin. Others, like many land snails and slugs, are major pests of crops and ship worms, a burrowing bivalve, can weaken and eventually destroy the hulls of wooden ships and wharves. Oysters can accumulate toxins from algal blooms and cause food poisoning and even death. 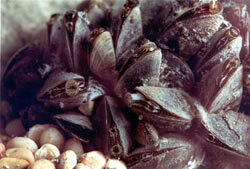 Zebra mussels, small, fingernail-sized mussels, have disrupted the food webs of many inland lakes by being able to successfully compete against native mussels. By eating much larger amounts of plankton they can reduce the energy available to the rest of the food web and can smother other organisms and cover and block structure built by humans. Molluscs are explored In this segment from YouTube.